I will sound like I just hopped out of a covered wagon, but one of the things I love about modern life is that wonderful books can be reborn thanks to technologies like print-on-demand (and probably other technologies I don’t even know about). 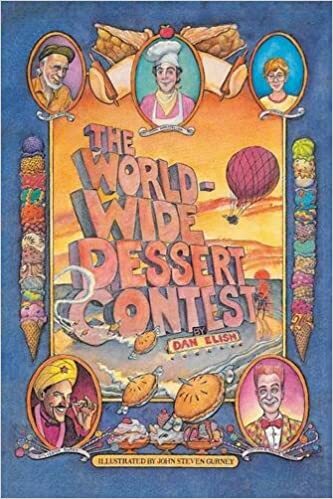 My dear friend Dan Elish (author of 9 novels and co-writer of the Broadway musical 13) is re-releasing his fabulous first novel (technically for kids, but I also feel I'm the ideal audience): THE WORLDWIDE DESSERT CONTEST. Obviously, any book that focuses on dessert should not be limited to kids! If you love books like The Phantom Tollbooth and Charlie and the Chocolate Factory and an oldie that I bet no one else has heard of but that I remember quite fondly, The Search for Delicious, this one is for you—and/or the kids in your life. Here’s a quick description, followed by an interview with Dan, in which he talks about the writing and publishing process. Meet John Applefeller, the chef who always finishes last because his apple desserts unexpectedly change into other things at the last second - often causing humorous mayhem at the dessert grounds. Luckily, Applefeller has the loyal friendship of a boy named Stanley and a scraggily janitor named Josiah Benson. Together, our heroes fly an apple soufflé balloon (one of Applefeller’s most notorious failed desserts) to the home of Captain B. Rollie Ragoon, a dessert genius who speaks only in rhyme. Will the famous Ragoon be able to teach Applefeller how to create a dessert that stays a dessert? Will Applefeller’s new dessert be able to defeat arch culinary villain, Sylvester Sweet? To find out, devour this book! What inspired you to write The Worldwide Dessert Contest? When I came to New York after college, my goal was to write musicals. But one day, on a whim, I found myself re-reading Charlie and the Chocolate Factory. I loved it and got the idea about writing my own children’s novel. Not to date myself, but this was just before laptops. I wrote most of the first draft of the book on yellow lined note pads, then edited it by hand. Finally, I got a home computer and typed it out. The entire process or writing and re-writing took about a year and a half. 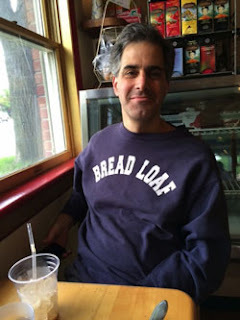 I was accepted to the Bread Loaf Writers’ Conference in Middlebury, VT. The book was sprawling then, around 300 pages, and the manuscript was single-spaced. But I gave a reading there that went really well. I was so nervous but people really went nuts – it’s one of my fondest career memories. Several faculty offered to introduce me to agents and editors. Luckily, one of the editors was Richard Jackson, one of the biggest names in kids’ publishing. So I definitely had a lucky break. Richard Jackson and I met me for lunch and offered to publish the book – first he wanted me to cut close to 100 pages (which I did) then we got to work honing the story. It was a great experience. In the middle of the story, the character’s travel to a land where everyone speaks in rhymes. Was that section fun to write? Yes, absolutely. I had written lyrics for shows (and still do) and I loved Dr. Seuss. So having a land where everyone spoke in rhyme came pretty naturally. I have great memories of sitting in my small NYC apartment with pages in front of me and a rhyming dictionary. I also remember reading the rhymed sections to my friends. What do you think makes the book special? The plot is outlandish and whimsical, but I’m proud of how it manages to seem believable, despite all the craziness. Call it beginner’s luck, but I’m really pleased at how the plot comes together in a way that is fun but doesn’t seem forced. I don’t know if I’ve ever done it quite so well since. Also, there are roller-skating apple pies, a flying apple soufflé balloon, and a dessert genius who speaks only in rhymes. How could that be bad? Does the book have a message? The book’s primary goal is to be entertaining and funny. But as I wrote, a message developed that seems to resonate with readers. The hero, John Applefeller, is a hapless guy who comes in last every single time he enters to contest. But he never gives up. The book is his story, one where simplicity and good-heartedness are eventually rewarded. I think the world can always use a little bit more of that. What made you want to republish it? Because I love it. Maybe that’s an obnoxious thing to say about your own book, but whatever…The Worldwide Dessert Contest was a success in its day, but like most books isn’t read as much anymore. A year or so ago a young filmmaker approached me about making it into a movie. (It was his favorite book as a kid). That got me thinking about re-issuing it. The original artist, John Stephen Gurney, gave me permission to use his amazing cover and drawings. Now I can re-introduce it to a new generation of readers. I thought it would be funny to call it The 28th Anniversary Edition. Hard to believe that much time has gone by. Really, any age. It’s a 200 page novel but I’ve known kids as young as first grade to read it. I also know older kids and adults who have loved it, too. That being said, I’d say between ages 7 and 12 is ideal. I am obsessed with mocha-chip ice cream. As a kid my favorite brand was Howard Johnson’s Mocha Chip. Today I favor Ben & Jerry’s Coffee Buzz Buzz. Most important, where can you buy it? Any website where books are sold or on Xlibris.com. Just type in my name or the title. John Applefeller loves desserts. He especially loves apple desserts and his dream is to win the prestigious Worldwide Dessert Contest held each year in his very own town of Appleton. Not only does Applefeller never win, he always comes in last, because his desserts have the disconcerting habit of turning into other things. The perennial winner of the contest is Sylvester Sweet, the self-proclaimed King of Dessert, Captain of Consumption, and Duke of Decidedly Delicious, but who is, in fact, a bounder using a stolen recipe for his every-year entry, a double-chocolate-fudge-raspberry-coconut-lime swirl. Applefeller and his able assistant, a fifth grader named Stanley, are becoming decidedly discouraged, until they hear about a genius chef who might be able to help. The addition of Captain B. Rollie Ragoon to their team leads to some new recipes and recognition, as well as to the downfall of the sniveling Sweet. The plot goes down as easily as ice cream and is topped with plenty of laughs, both subtle and broad. Certainly its silliness makes for a pithy read-aloud and a booktalker's dream. Call this delicious. Publisher's Weekly: "A little dash of Charlie and Chocolate Factory with a dash of Homer Price's donut maker, this novel pays homage to the longstanding rapport between children and sweets…Elish writes with a sure hand of this sugary world, his tongue squarely in the area of his sweet tooth. For his ability to praise desserts in an endlessly original fashion, he deserves a blue ribbon." Dan Elish is the author of nine novels, including The School for the Insanely Gifted (for kids), Nine Wives (for grown-up types), and Born Too Short, which won a 2004 International Reading Association Students’ Choice Award for young adult literature. Dan is also the co-book writer for the Broadway musical 13 and is the book writer and co-lyricist of MANN…and WIFE, a new musical comedy that recently had its world premiere at the Lyric Theater of Oklahoma. He has also written many kids’ musicals and scripts for TV shows, notably Cyberchase. He lives in New York City with his wife and two children.